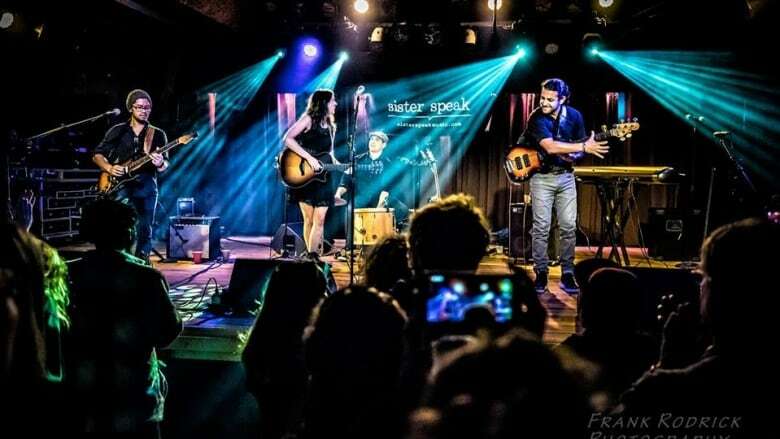 Led by Sherri Anne and backed by various talented musicians, Sister Speak brings alternative blues, indie-pop and world music to the stage. Led by Canadian-born Sherri Anne and backed by various talented musicians, Sister Speak brings alternative blues, indie-pop and world music to the CBC Musical Nooners stage on Aug. 15. CBC Musical Nooners are free, live music concerts that happen every weekday on the CBC Vancouver outdoor stage at 700 Hamilton St., from noon to 1 p.m.
Based in California and British Columbia, Sister Speak has performed as a solo act, duo and band in hundreds of concerts across North America and Central America. Their debut album, Rise Up For Love, brings in strong lyrics with a blend of acoustic tunes, blues and world pop, with Grammy Award winning engineer Alan Sanderson at the helm. Sister Speak's upcoming album is set to release this fall. While we do control the line-up, we can't control the weather. Be sure to follow @CBCVancouver and #musicalnooners on Twitter, for updates and schedule changes due to inclement weather.